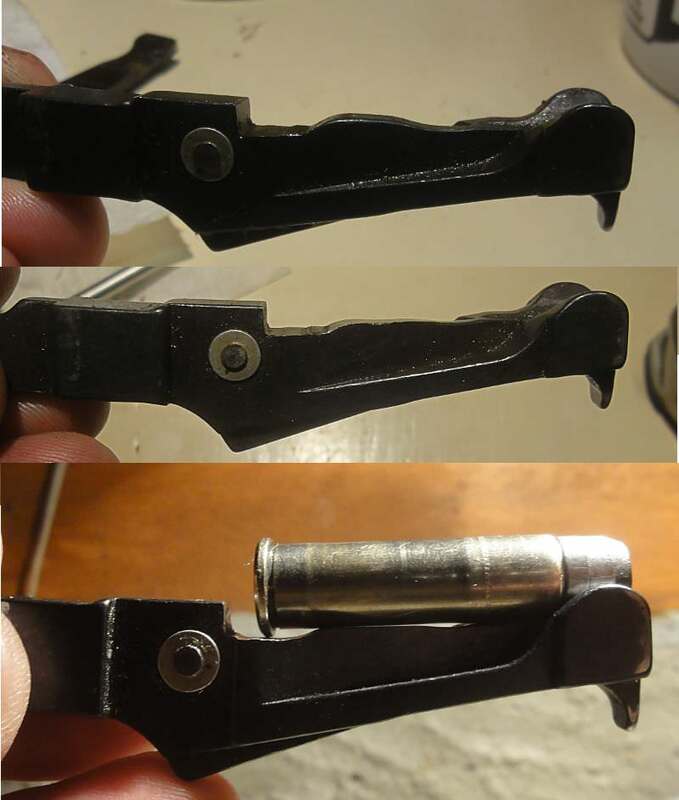 I've posted previously on my attempts to mod the 1894C to feed longer cartridges. I modified the carrier as several authorities had suggested, but that didn't gain much. The modded carrier would indeed swallow a longer cartridge, but then the meplat would crash into the barrel breech before the carrier could finish lifting the bullet up to the barrel. Max COL was limited to 1.600" - 1.610" with blunt bullets (a smaller meplat would prolly allow a longer COL, but who wants to shoot small meplats ? ). Pic shows jam with longer cartridge. The bolt has pushed the meplat against the breech before the carrier finished lifting. Today I tried modding the carrier "bump." The bump affects the angle at which the cartridge sits on the carrier. I figured that if I filed down the bump, the rim of the cartridge would sit lower, so that the bullet would point upward a wee bit more. We're only talking a few degrees. Pic shows the standard "bump," then the filed down bump, then the cartridge sitting on the modded carrier. The bump mod increased the max COL from 1.600" - 1.610" to 1.620" - 1.630". Woopee Doo ! In hindsight, the bump mod did not gain enough to be worth the bother and the risk. Yet, I hear 44 mag 1894 owners talking about feeding 1.65" - 1.70" bullets without any problems. What's different about the 44 ? How does the 44 carrier lift up in time to avoid jamming the meplat into the breech ? 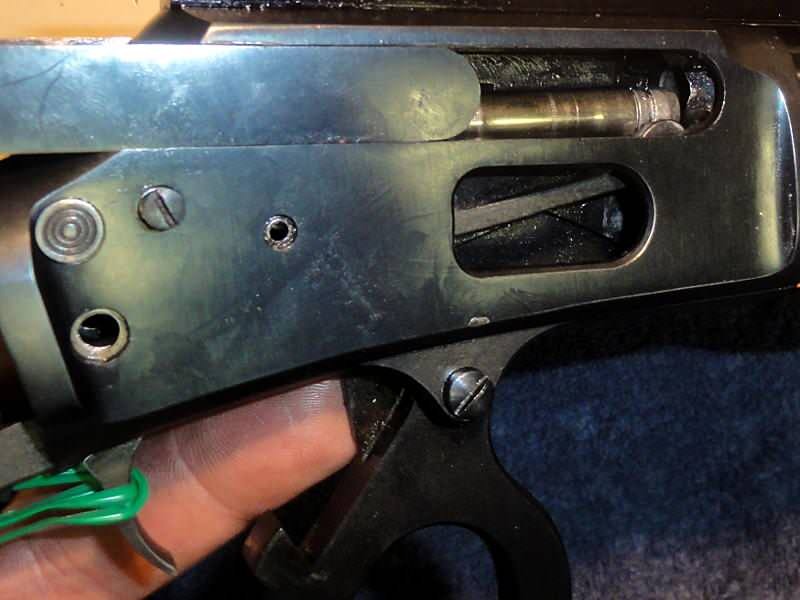 Studying this picture (from the Marlin owner's forum), I finally noticed that the spring loaded pin was located in a different spot on the 44 carrier. To my way of thinking, that should make the 44 carrier rise sooner than the 357 carrier, all other things being equal. What I've learned so far is that longer COL's seem to require the to carrier rise sooner. As best I can figure, that either requires 1) building up the lever where it cams against the spring loaded pin, or 2) relocating the spring loaded pin, similar to the 44 carrier. The lever is heat treated to be file hard, so if I mod it by building it up with weld, that's going to screw up the heat treatment. An un-heat treated lever would probably still work, it's just that it would wear faster. Still, I'm not thrilled about taking the risk. The other option is to buy a 44 carrier. It might have to be built up with weld (or even JB weld) to hold the 357 cartridge at the correct height, but that's easy to do. And if I decide I don't like the 44 carrier, I can always put the 357 carrier back in, so there's very little risk. All it takes is money ! However, Marlin is very proud of their carriers and I haven't won the lottery lately, so the 44 carrier may have to wait for Santa Claus. If I'm missing an easier way to fix the problem, feel free to enlighten me. 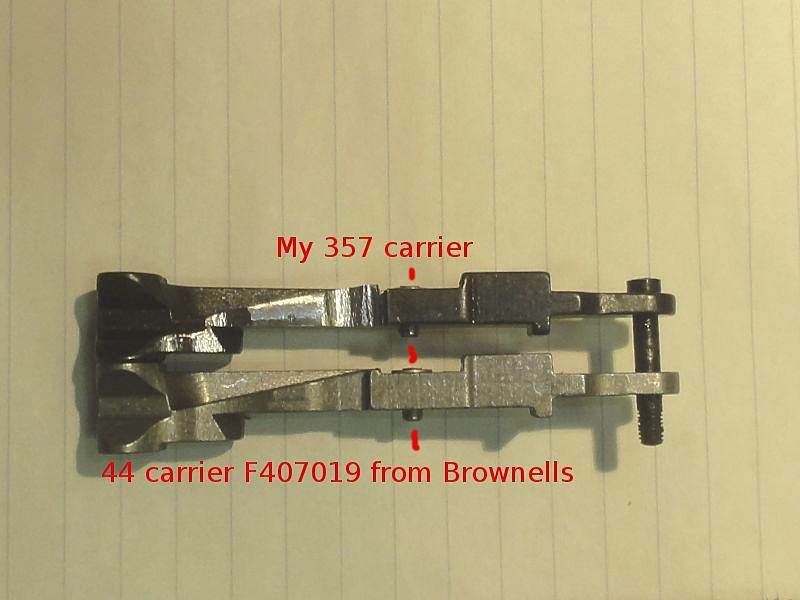 A 44 carrier showed up today, but its spring loaded pin is in the exact same location as my 357 carrier (I measured it with calipers relative to the pivot hole), so the timing would be the same. So maybe that photo posted on the Marlin Owner's forum was an optical illusion ? Or maybe the pin location has varied over the years ? Either way, I'm not making any progress here. Here's another pic from the Marlin Owner's Forum. From this perspective, the 44 pin appears to be in the same location as the 357 pin, so maybe the Marlin Owner's photo that I posted earlier was just an optical illusion caused by the camera angle? Sigh. FYI, I installed the 44 carrier in my 1894, and it cycles my normal 357 loads well enough. So go figure. I'm going to stare at my 357 carrier for a while and ponder whether I want to attempt to relocate the pin. I'd have to remove the existing pin, weld up the hole, drill a new hole (it appears to be a stepped, 2-diameter hole), and then reinstall the pin in its new location. And I have no idea where the ideal location is -- it would be a shot in the dark. I would remove the pin that is in ther and plug the hole with a piece of drill rod or something similar and drill a new hole for the pin.The "plug needs to be a press fit of course and then drill the new hole and see if that helps.Unrelated, but i had a fit issue with my Rossi in 45 colt, i had you build a mold for me in 45 colt, 350 grain and i fit it to my Ruger cylinder, had to do some mods to get it to function reliably in both.If you plug this hole instead of welding, you won't have to worry about losing hardness. jbquack1 wrote: I would remove the pin that is in ther and plug the hole with a piece of drill rod or something similar and drill a new hole for the pin. The pin is a spring loaded assembly, not a solid pin. The assembly appears to be held together with a rivet, so you'd have to grind off the rivet, possibly destroying the pin in the process. The hole has a step so the new hole would have to be bored or milled, not merely drilled. Then you'd have to re-rivet the pin, which might require making a replacement pin from scratch. After giving it a lot of thought, I decided I'm not going to pursue the longer COL at this time (unless someone demonstrates a way to do it that is cheap and easy). If I wanted to spend a lot of time and money improving the Marlin's performance, I'd be better off installing a custom barrel with a good throat, because I'm sure that would improve accuracy. At the rear of the carrier there is a hole, wondering if you could move that forward some without binding up the action? I'm thinking relocating that hole forward would move the assembly back?Not familiar with Marlins so the idea may be worth what i charged you to put it on here. jbquack1 wrote: At the rear of the carrier there is a hole, wondering if you could move that forward some without binding up the action? I'm thinking relocating that hole forward would move the assembly back?Not familiar with Marlins so the idea may be worth what i charged you to put it on here. Thanks for being interested in my project, jbquack1. I was hoping one of the Marlin gurus would weigh in and teach me how to do it right. I've looked on the Marlin Owner's forum, the Beartooth forum, and Paco's Levergun forum, and couldn't find any hard facts, just some vague BS. As for moving the carrier pivot hole, that's complicated, too, because the carrier meshes with the bolt lock. The Marlin action is actually fairly complicated compared to a bolt gun. There's a lot going on inside the action and everything has to be timed just so. You hear a lot of stories about Marlins jamming or not feeding, and that's why. So maybe the pivot hole mod could be done, but I'm not feeling up to it at the moment. I've heard that that M.L. McPherson (a gunsmith who specializes in Marlins) has modded the 1894 to feed longer cartridges, but if that is the case, he doesn't seem to want to share his trade secret, and I can't blame him. McPherson: What is Possible With a Marlin ? The other problem with the two-piece stock is that this system makes it impossible to isolate the barreled action from the bench and associated variations in shooter hold, etc. Firing good groups with any such gun is an exercise in patience and in paying attention to details that even many serious benchrest shooters may have not even considered. After years of serious testing, I have concluded that how the shooter holds his tongue probably matters! I have said essentially the same thing -- that the 1894 "jumps" and "twists" when it is fired from the bench, making it a surprisingly challenging gun to benchrest. Glad I'm not the only one who thinks so ! 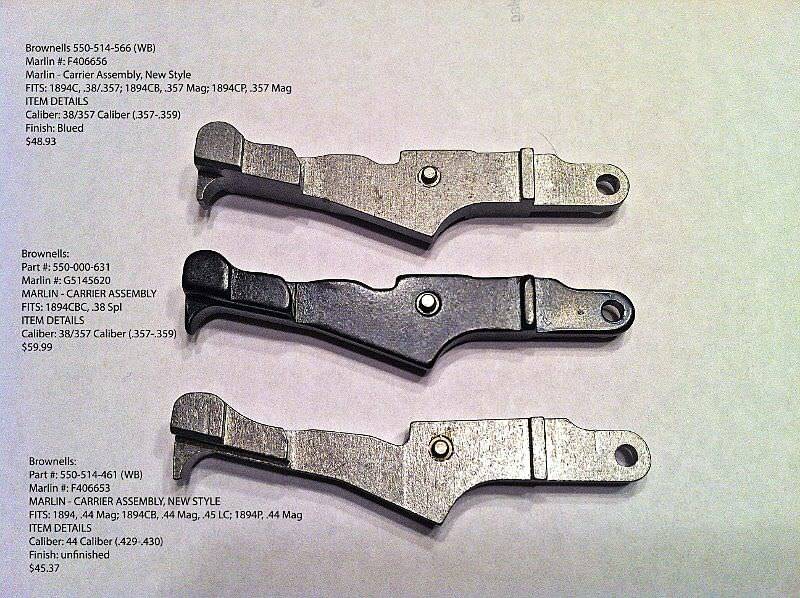 Cartridge overall length for the various M3 wildcat conversions is set near 1.83-inch, which takes advantage of maximum feasible cartridge handling length of this receiver (requires significant modifications to many parts but does not alter finger-lever travel or increase action manipulation force!). So yes, he does have a mod to increase COL from the factory 1.61" to 1.83", but it's not an easy mod. I have never tried much in the way of accuracy work with my lever guns, Paco has an article on the leverguns website about accurizing them, but that would be another project added to the list of things i won't finish this time around!Looking at your other thread about 180 vs 190 grain bullets, it looks like you have a pretty good setup for putting meat in the freezer. I read on carrier modification for cowboy action shooting. there is even a tutorial on the marauder website. is feeding in the chamber. Maybe this combined with the carrier mod is the solution for fitting longer cartridges.